Call attention to your brand with our Wine Stain sticker design template, ideal for wineries, tasting rooms, decorative artists, jewelry designers, craftsmen, and other companies that offer artisan products and services. 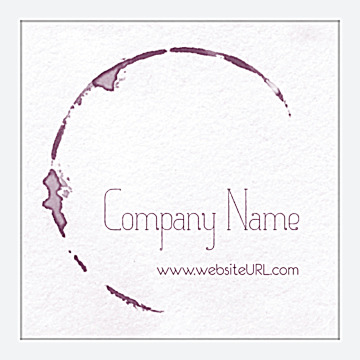 Wine Stain features a neutral background with a swirled wine stain and a customizable space for your company name and website URL or other desired text. Available in four different color schemes, two shapes, and three unique edge finishes, elegant Wine Stain stickers will appeal to your customers and call their attention to your creative products or services when handed out as a promotional item. Design and print custom stickers with our online sticker maker today! Our online design tool makes it easy to personalize professionally-designed sticker templates such as Wine Stain in just minutes. Simply pick your template, shape, edge design, and color scheme, then let the intuitive tool guide you through adding your custom text. When you’re done you can even download a free PDF to share with team members before printing your custom stickers. Find out why thousands of businesses turn to PsPrint every day when they need professional-looking marketing tools. You can trust that you’ll get fast turnaround and reliability with every printing project. Our stickers are printed on premium paper stocks with vibrant soy-based inks (which are richer than traditional petroleum-based inks). And, all our sticker printing services are backed by our 100% customer satisfaction guarantee, so you know you can rely on PsPrint to deliver stickers you’ll be proud to use! If you’re looking for an extra special sticker, consider adding a custom metallic foil stamp to your design. Or, print die-cut stickers in almost any shape you can imagine. Our custom printing team is on standby in case you need any assistance with your sticker project. And don’t forget PsPrint offers other promotional products including magnets, memo pads, calendars, and more!